Super happy customer here! Georgie my new baby russian tortoise is perfect. I searched carefully for a tortoise breeder that offered on captive bred russian tortoises for sale online and I am happy I chose TT! Shipping was safe and secure and Georgie came out very active and ready to eat. If you are looking for a baby russian tortoise then do not go to the pet store! They are all wild caught young adults. 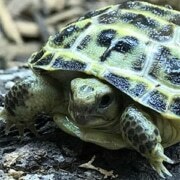 Real captive bred baby russian tortoise for sale are more expensive but WELL worth it! We love her already!! !